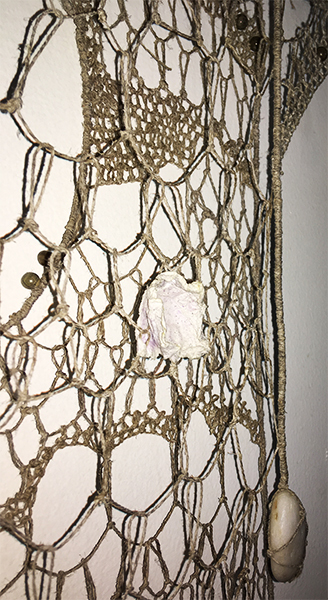 In recent years, most of my work in fibers makes use of the needlelace technique—some of the same stitches used by traditional lacemakers, but arranged freely and intuitively. The pieces often include handmade paper and natural objects such as river stones. Life Emerges is a direct expression of concepts that show up in most of my work—the mystery of organic life appearing and diversifying. whether from the sea or space or the primordial muck. 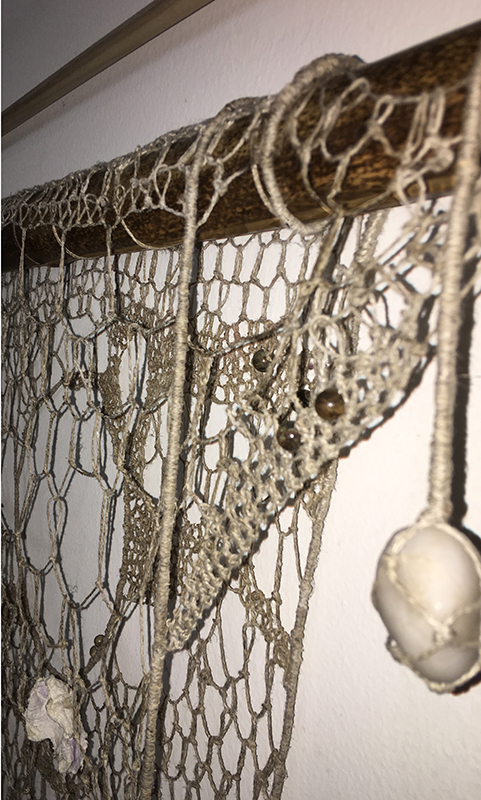 A double-layered piece hung over a bamboo rod. 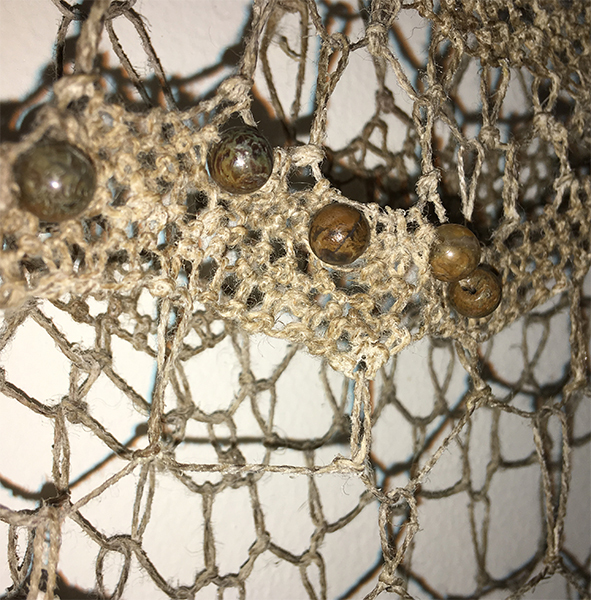 Linen yarn, handmade paper, river stones, jasper beads, 31 in. H x 36 W x 2.5 deep. Morning is all in silk yarns with a few agate beads. Linen, wool, and cotton yarns with river stones. 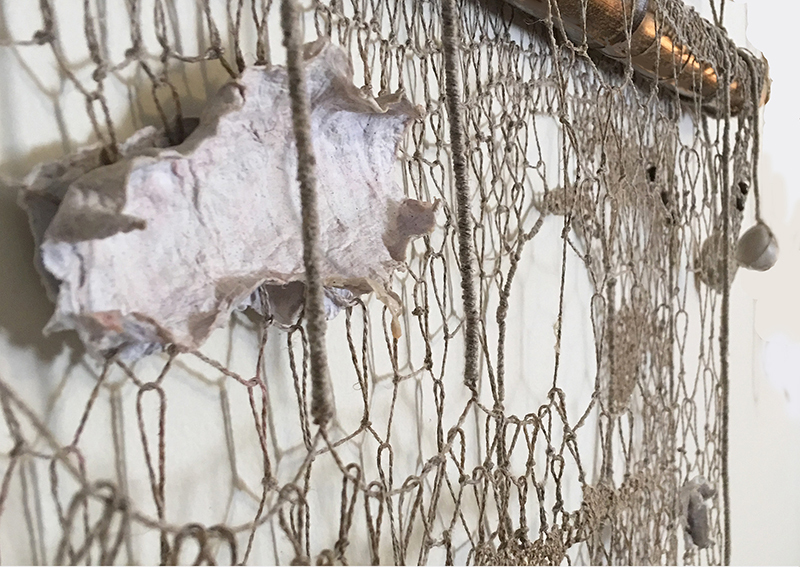 Needlelace, needleweaving, coiling, wrapping, on a metal frame, 25 in. H x 30 W x 2.5 deep. Detail of Wind, a large piece in a private collection. The messages are written inside the scrolls. Pat has long been a visual artist as well as an author. Her most recent exhibits have been in North Carolina and in the Mexican town of San Miguel de Allende, where she and her husband lived for nearly fourteen years. Her NC exhibits include one-woman shows at the North Carolina Crafts Gallery and Carrboro Town Hall, as well as works in the juried North Carolina Artists and Durham Art Guild shows. Pat earned degrees from Duke, Hollins, and U.Ga., and taught art in Virginia schools and in several programs for the talented and gifted. For some years, she lived on an old Shenandoah Valley farm where various artists held creative workshops. Her earlier works were shown in southeastern U.S. galleries and museums, including juried shows at the Virginia Museum; the Mint Museum of Art; the Athens, GA, Lyndon House Art Center; and the traveling exhibit Southern Sculpture. Her essay “Reveyesed I’s” was published in the anthology Creativity (Simon & Schuster, edited by John Brockman). Some earlier pieces in various media (most now in private collections). Crow, 1985 computer drawing won $5500 from MacWorld magazine.